UNK professor Dr. Diane Duffin discusses how to speak to elected officials and advocate for issues with youth at the 2013 Nebraska Youth Academy for Democracy. 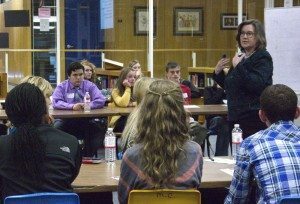 The Nebraska Youth Academy for Democracy provides a forum for Nebraska youth to engage in an open dialog about politics and issues. Students will learn about current issues, build advocacy skills, network with other youth, and voice their opinions and concerns with Nebraska State Senators. The forum will begin with a keynote titled “Is Nebraska Immune to Polarization?” which will be presented by Dr. Elizabeth Theiss-Morse, professor of political science at the University of Nebraska at Lincoln. This speech will be followed with breakout sessions that include topics such as immigration, presented by Darcy Tromanhauser, director of the Immigrants and Communities Program, Nebraska Appleseed; child welfare, presented by Sheri Dawson, RN, deputy director of the Division of Behavioral Health, Nebraska Department of Health and Human Services; marijuana legalization, presented by Tony Coder, assistant director of the Drug Free Action Alliance; and gender equality, presented by Amber Lewis, women’s studies teacher at Kearney High School. Later in the day, students will have a chance to speak with Nebraska Senators Galen Hadley, Danielle Conrad, and Ken Haar during a panel and in special breakout sessions. There are still open seats available for youth who wish to attend the Academy for Democracy. If you know a Nebraska youth who would be interested in attending, please direct him/her to bcyab.org/yad to complete the registration. This project was supported in whole or part by Grant # 93.959 under the Substance Abuse Prevention and Treatment Block Grant from the Substance Abuse and Mental Health Services Administration Center for Substance Abuse Prevention and the Nebraska Department of Health and Human Services.